Since the fall of frog kits and their increasing values due to rarity various rogues have from time to time been tempted to try to pass off frogspawn as the genuine article. This will undoubtably continue so it is important to carefully examine any such models you may see on sale for parts substitution. The model below appears to be a gold token edition of the Amy Johnson Gypsy moth but only the box is genuine the kit inside is a Novo model, in this case correctly and honestly sold as such within the Frog box. But were this to have been sold with the original Frog instructions and decals it could be very difficult to claim provenance without a genuine original to compare against as many do not have a new makers inscription inside the parts and it would be left to the buyers knowledge of the colours used for plastic mouldings and the dates that they apply to. Quite a problem. Buyers Beware- always. Last edited by lancfan on Sat Dec 30, 2017 2:23 pm, edited 2 times in total. If it is broken then fix it but if it isn't- LEAVE IT ALONE! Member of Airfix Tribute & Revell-Ations Forums. lancfan wrote: Since the fall of frog kits and their increasing values due to rarity various rogues have from time to time been tempted to try to pass off frogspawn as the genuine article. This will undoubtably continue so it is important to carefully examine any such models you may see on sale for parts substitution. 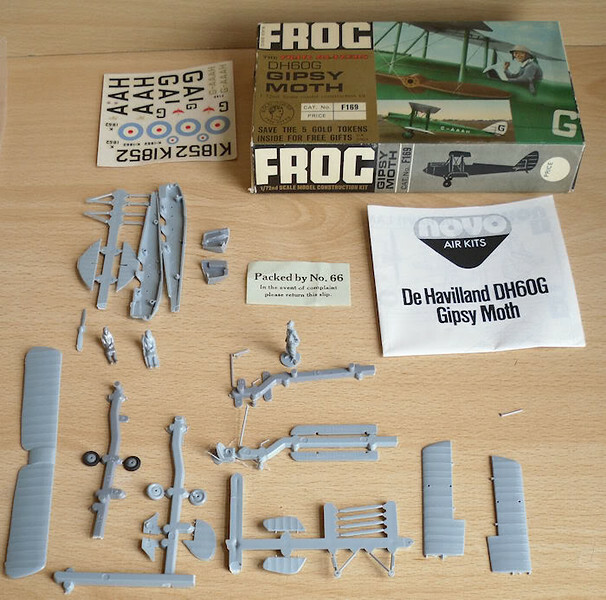 The model below appears to be a gold token edition of the Amy Johnson Gypsy moth but only the box is genuine the kit inside is a Novo model, in this case correctly and honestly sold as such within the Frog box. But were this to have been sold with frog instructions and decals it could be very difficult to claim provenance without a genuine original to compare against as many do not have a new makers inscription inside the parts and it would be left to the buyers knowledge of the colours used for plastic mouldings and the dates that they apply to. Quite a problem. Buyers Beware- always. Once bought a "Frog" Canberra contained parts from both a Novo and Frog, the Novo in light grey and the Frog in very dark blue !! Watch the website for a Novo Bogus kit article !! !